Mikey’s journey to the sales yard exemplifies how a good horse can end up, through no fault of his own, on the truck to the slaughterhouse. 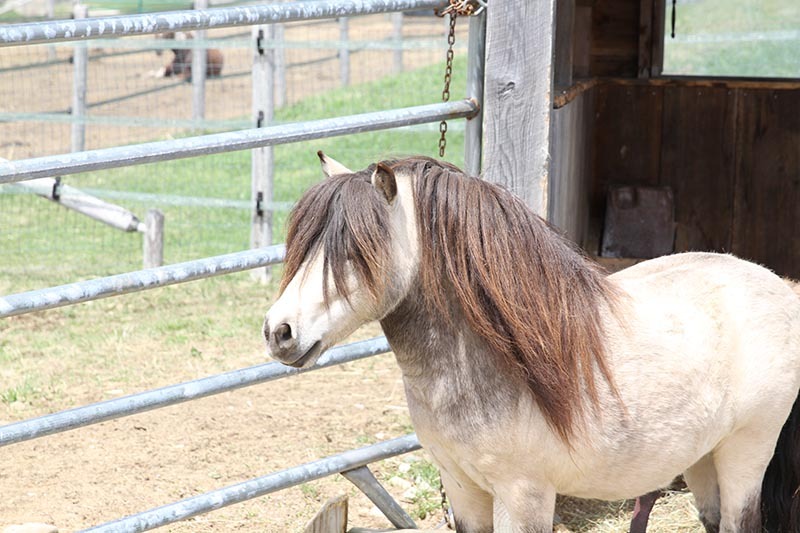 Mikey is a registered miniature horse with nice confirmation, free of the flaws that plague some minis. His breeder sold him to a family as a 3-year-old, where he lived the next seven years of his life as a backyard pony. His breeder, also his farrier, visited him regularly. He was healthy, gentle, quiet and calm. He never bit or kick, had no vices, and lived a happy, stable life. For unknown reasons, Mikey was sold, and one month later ended up with a dealer at a slaughter auction. This silver dapple buckskin gelding was clearly overwhelmed by the auction scene, but responded politely to any request asked of him. Horses With Hope pulled him out of the sale, and brought him home to recover from the shipping cough he had contracted through his month of travels. It was easy for Mikey to forget about the auction yard—having never been treated roughly in his life, the whole incident appeared as some strange anomaly to him, and left his sweet personality and kind manners unscathed. Update: Mikey is just about as sweet and cute as they come. After handling and getting to know him quite well, it became apparent to us that he would make an excellent ambassador for our program. We hope to travel with Mikey to different events and shows in order to promote rescue horses.